The Seven Wonders of Central Oregon…. I love lists…especially outdoor related lists. Ever since Travel Oregon’s wildly successful Seven Wonders of Oregon campaign, I’ve brainstormed about what would be on my list of the Seven Wonders of Central Oregon. As I debated and compiled information and images of the locations on this list, I was astounded. What other area of the country has the quality and variety of outdoor destinations that Central Oregon enjoys? Central Oregon is blessed with a plethora of outdoor opportunities which made the formulation my list a wonderful challenge. I hope you enjoy my list of the Seven Wonders of Central Oregon and feel free to share a link to this list with your friends. If you have something to add, please leave your comments at the end of this article. 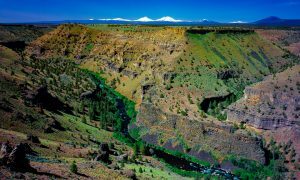 Central Oregon’s Deschutes River is the life line for this wonderful and diverse region of Oregon. Without the Deschutes River, there would be no agriculture and recreational opportunities would be limited. Inclusion of the Deschutes amongst the Seven Wonders of Central Oregon is virtually mandatory. It is scenic, diverse, life-giving and it offers endless recreational opportunities. Hiking, fishing, boating, mountain biking, and horse back riding are all popular along the shores of the Deschutes. 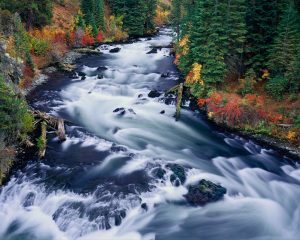 Although there are too many highlights to mention, some highlights of the Deschutes and its tributaries include: The Deschutes River Trail, Tumalo Falls, Mirror Pond / Drake Park, and Shevlin Park. The Deschutes River is quite simply the soul of the region. Tributaries such as Paulina Creek, Fall River, Tumalo Creek, Whycus Creek, The Metolius River( see #4 below) and the Crooked River contribute to the Deschutes during its 252 mile route north to the Columbia River. 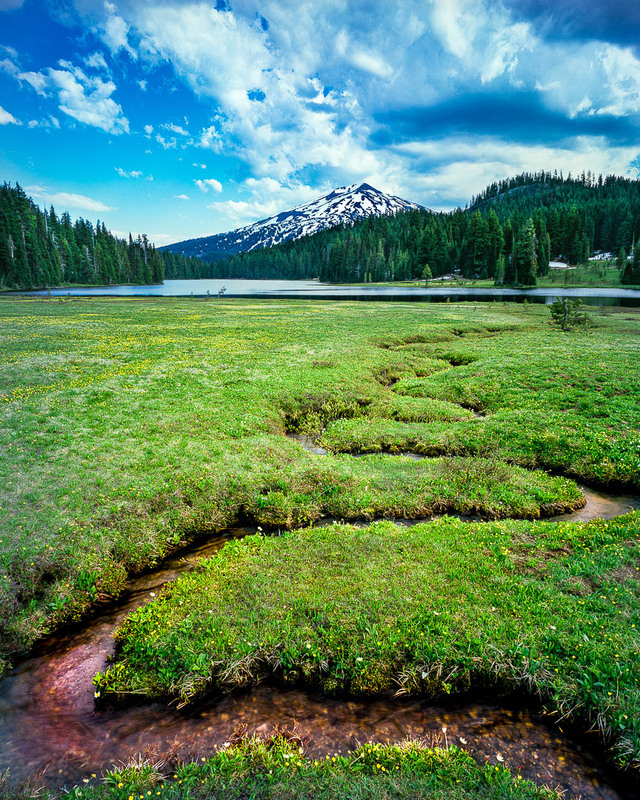 For technical reasons, the Deschutes is often divided into three distinct parcels. The Upper Deschutes River. The Headwaters of the Deschutes are at Little Lava Lake, located along the Cascade Lakes Highway(see #7 below). The Deschutes inauspiciously ebbs out of the picturesque Little Lava Lake and slowly meanders south along the Highway. The “Upper Deschutes” extends from the Headwaters to the city of Bend. Deschutes is siphoned off for agricultural purposes. This leads to low water levels and therefore dangerously high water temperatures in the Middle Deschutes during irrigation season. 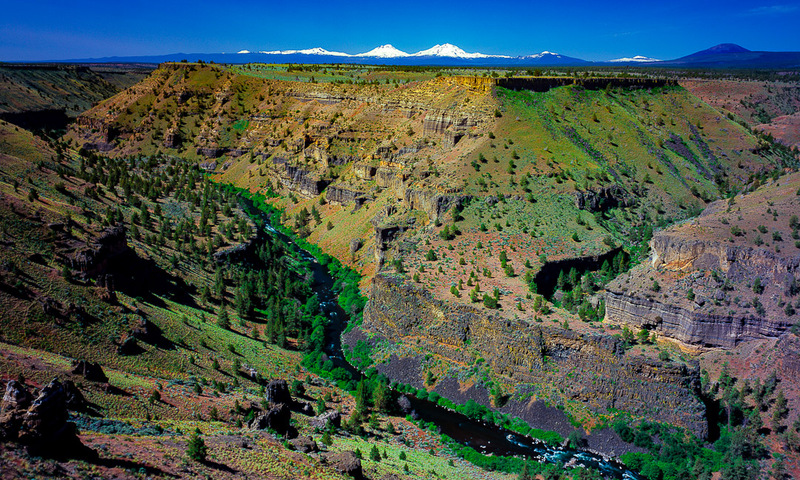 The Middle Deschutes River courses through a more largely treeless,arid environment and it carves a deeper canyon, creating epic views like you see to the right! The Middle Deschutes starts down river of the City of Bend and ends at Lake Billy Chinook, which is the result of the Deschutes River being dammed. 3. 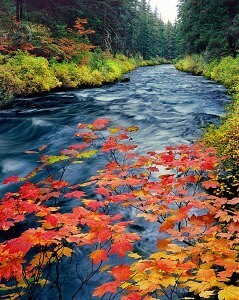 The Lower Deschutes River. 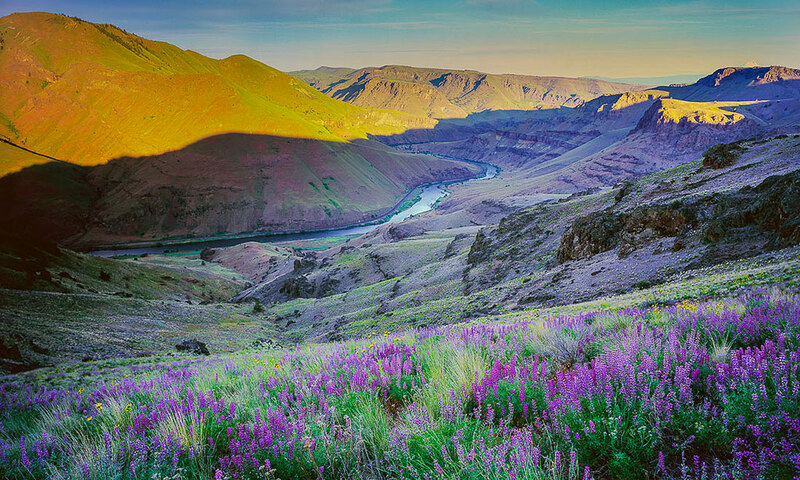 The Lower Deschutes River extends from Lake Billy Chinook to the confluence of the Deschutes River with the Columbia River, in the Columbia River Gorge. The Lower Deschutes River is the stuff of fly-fishing documentaries. It is a big, dry-flanked, bold,western river. It its consistently rated as one of the best flyfishing rivers in the United States partly because of the trout fishing during legendary salmon fly hatches but more so because of seasonal steelhead runs which draws in fly fishermen( and women) from around the world. volcanoes which top out at over 10,000 feet in elevation. In 1964, the Three Sisters Wilderness Area, was established. 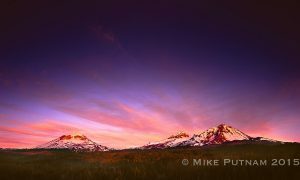 The Wilderness encompasses over 286,000 acres and includes the aforementioned Three Sisters as well as Broken Top Mountain. 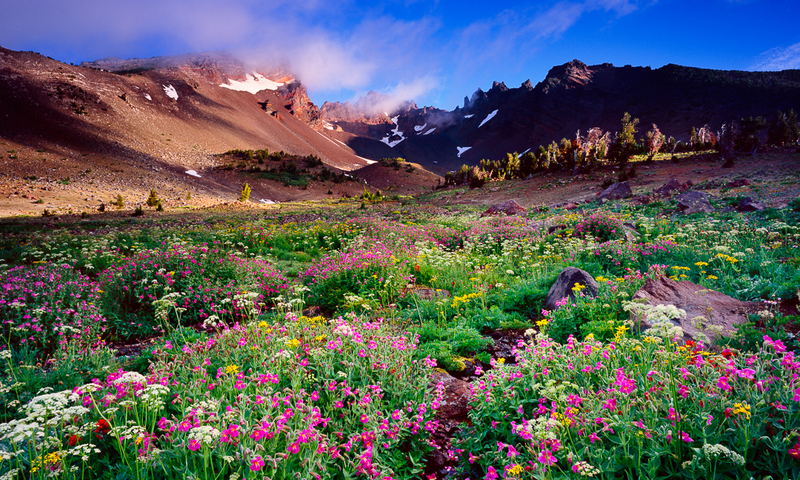 Broken Top Mountain, tops out at over 9,000 feet in elevation and offers many epic hiking opportunities. Broken Top Trail, Green Lakes Trail, and Tam McArthur Rim are some local favorites. The wilderness is bisected by 40 miles of the Pacific Crest Trail. Popular access points for hiking in the wilderness include the Obsidian Trail, located west of the Three Sisters, and the Polk Creek Trail Head, near the city of Sisters. Included in the wilderness are countless other gems such as waterfalls, wildflower meadows, streams and lakes. A new favorite I discovered in the Three Sisters Wilderness Area is Resurrection Falls. 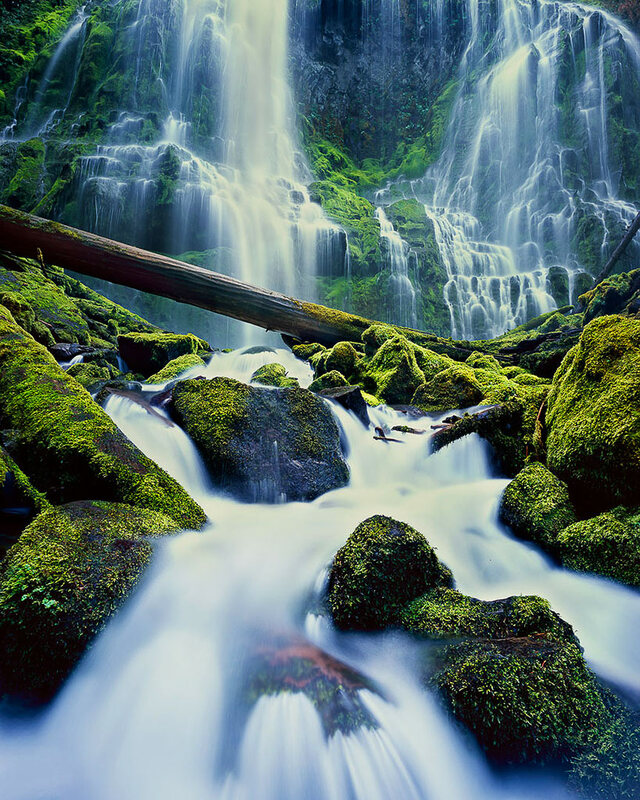 An old favorite amongst locals and visitors is 226 foot tall Proxy Falls, seen to the right. Proxy Falls is almost worthy of being one of the seven wonders of Central Oregon by itself! Proxy is on the West side of the Wilderness Area and is easily accessible from Highway 242, also know as the Mckenzie Highway. Some popular trailheads for accessing the Three Sisters Wilderness include, the Green Lakes Trailhead, the Pole Creek and Three Creeks trailheads, both located near the town of Sisters, Oregon and the Obsidian Trailhead located on Mackenzie Pass, slightly west of the Pacific Crest Trail. 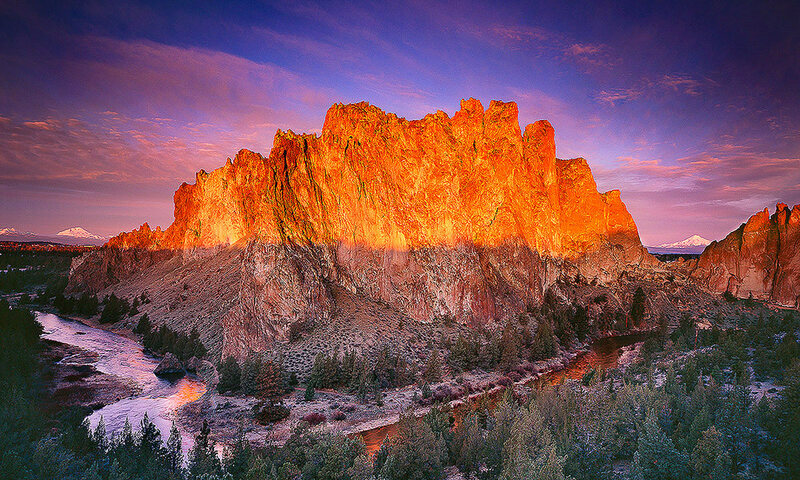 Sunrise on Oregon’s Smith Rock State Park. 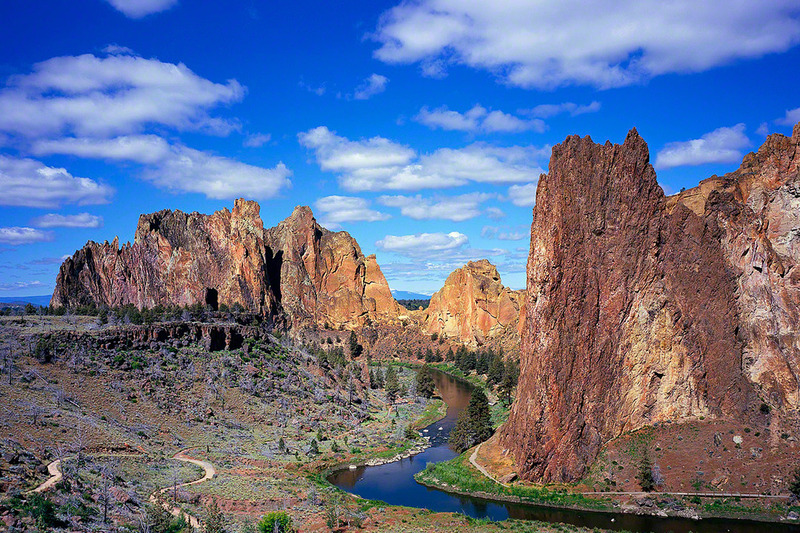 The Seven Wonders of Central Oregon wouldn’t be complete without Smith Rock State Park. 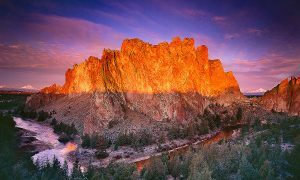 Yeah, I know, Smith Rock State is considered one of the 7 wonders of Oregon, deftly promoted by Travel Oregon. Well…it is undeniably located in Central Oregon, so, we get to claim it too! Located a scenic 25 minute drive from Bend, Smith Rock is a world class rock climbing destination. On warm summer days, visitors will recognize countless different accents from climbers and hikers from around the world. Located near the sleepy town of Terrebonne, Smith Rock tends to get very crowded on summer weekends. Consider yourself forewarned! Walk in bivouac camping is available at the park on a first come first serve basis. Smith Rock is a a vertical world unlike anywhere else in the Pacific Northwest. 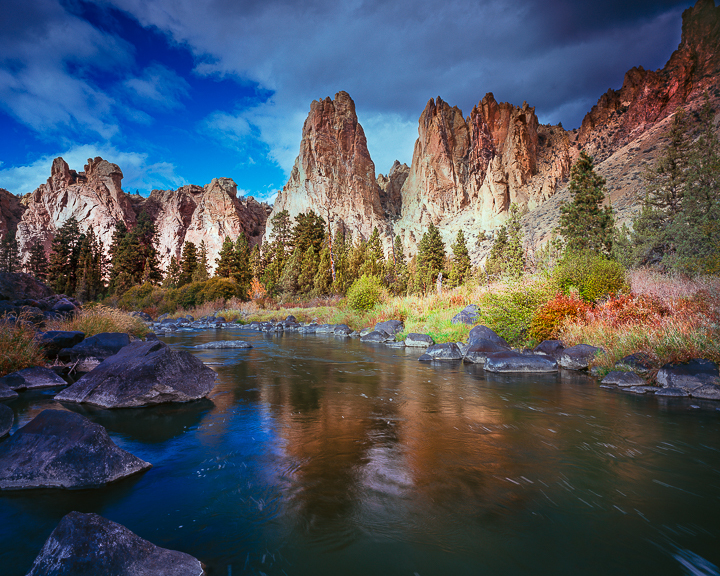 The Crooked River gently slaloms around the park’s vertical spires. Mule deer, Golden and Bald Eagles, River Otters and Rattlesnakes can often be spotted within the park. Yes, Rattlesnakes! Hiking trails abound and the “Misery Ridge Trail” is a favorite amongst visitors. Beware that this trail is not appropriate for people predisposed to acrophobia. Although relatively small, ( 640 acres) Smith Rock is a stunning example of the bewildering diversity of the Central Oregon region. Vertical towers jutting over 600 feet into the sky, a meandering river flanked by basalt columns, the surrounding high desert and stunning views of the Three Sisters, Mt. Bachelor and Mt. Jefferson make for an unforgettable experience. Smith Rock State Park and the Crooked River, Central Oregon. Some of the better know rock formations at Smith Rock, include the cleverly named, “Smith Rock Group”, the balanced rock at Asterisk Pass, Morning Glory Wall, the Red Wall, and the rocky spires of “the Monument”, seen in the photograph to the left. For more extended exploration of the Smith Rock area, consider hiking up the “Burma Road” for dizzying views down to Smith Rock. There are modest wildflower blooms in the Park which are usually witnessed from May to July. The adjacent, Gray Butte, has a large and wild trail system which begs for exploration from intrepid visitors. Smith Rock has a small visitor center located in a yurt, adjacent to the main parking area which serves as a wonderful source of information for visitors. Perhaps the most underrated of all of my seven wonders of Central Oregon is the the amazing Metolius River. The Metolius offers fantastic fishing, hiking and family friendly sight seeing. 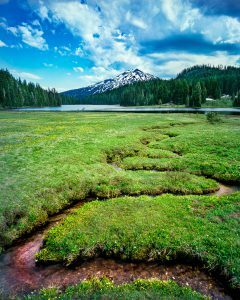 The Metolius magically springs from the ground at the base of Black Butte, a symmetrical mountain located east of the Pacific Crest. 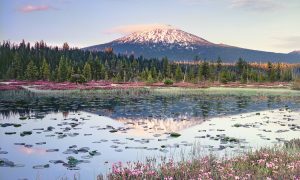 Black Butte, a symmetrical cinder cone, tops out at 6,400 feet of elevation and offers excellent hiking and sweeping views of the Pacific Crest from its summit. 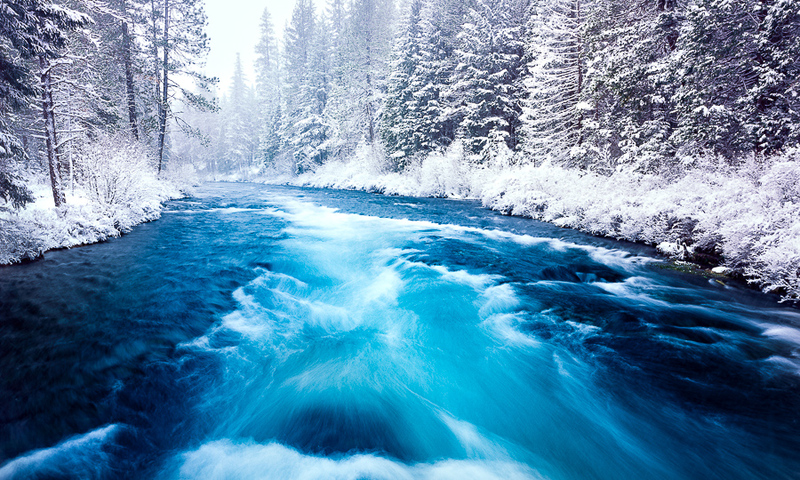 The waters of the Metolius are pure, cold, and have have an alluring blue tint, reminiscent of Daiquiri ice. The Metolius is a famed trout fishing river filled with finicky rainbows, browns and even bull trout. Fishing in the Metolius is restricted to fly-fishing only and barbless hooks are required. It is the kind of river where 10% of fishermen catch 90% of the fish, so don’t be alarmed if you have little success on your first fishing expedition on the Metolius. Hit or miss, fishing on the Metolius is an amazing experience because the setting is so stunning. Old growth Douglas Firs, and Ponderosa Pines, strikingly clear water, peekaboo mountain views and the charming community of Camp Sherman all stimulate the senses. Visits to the Metolius are not complete without visits to the Wizard Falls Fish Hatchery to feed huge rainbow trout and a visit to the Camp Sherman Store. The store is a magical time capsule, offering basic provisions as well as fly fishing supplies, craft beers, excellent cold cut sandwiches and souvenirs. Central Oregon’s amazing Metolius River in its winter glory! Wizard Falls, seen to the left, is about five miles down stream from the Camp Sherman Store. It is adjacent to the fish hatchery, which is a wonderful attraction of families. The West Metolius Trail begins at Lower Canyon Creek and travels down-river. Less than one half mile from the trailhead, a wonderful spring gushes from the banks of the Metolius into the river. Wizard Falls and its eponymous fish hatchery are approximately 2.7 miles from the trailhead. For more exploration, I recommend hiking or biking downstream from Lower Bridge where the river is largely undisturbed by man. in this lower stretch of the Metolius River, it gains speed, volume and beauty before its stoppage at Lake Billy Chinook which is dammed by the Pelton Round Butte dam. 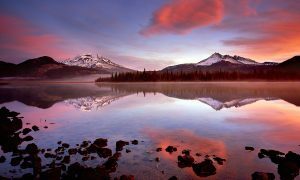 Located Northwest of the Metolius River Basin is the most rugged member of the Seven Wonders of Central Oregon, the Mt. Jefferson Wilderness Area. Accessible from multiple trailheads, the beauty of the Mt. Jefferson Wilderness has to be earned. Shorter access trails such as Pamelia Lake from the west and Jack Lake from the east are crowded in summer months. Many other trail heads access the Mt. Jefferson area but most require arduous yet invigorating approaches. Mt. Jefferson, seen to the left, is Oregon’s second tallest mountain at 10,497 feet elevation and arguable Oregon’s most photogenic mountain. The Jefferson Park area offers stunning alpine meadows, numerous small lakes, blueberries, huckleberries and in productive years offers heavenly wildflower meadows. Endless miles of rugged trails are available in the wilderness area for hikers and horseback riders. Early season jaunts offer endless stands of rhododendrons blooming at lower elevations. 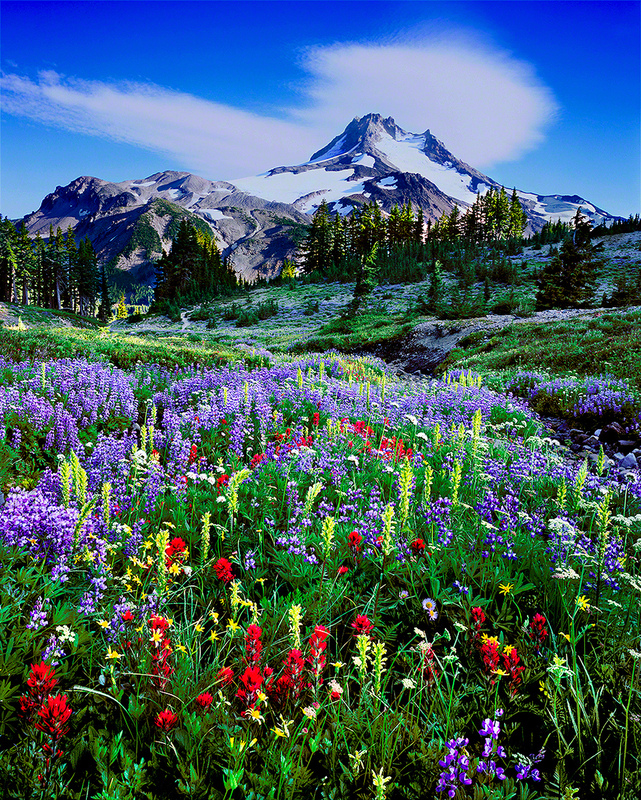 During summer, Indian Paintbrush, lupines, monkey flowers, and asters decorate alpine meadows. In late summer and early autumn, the reds yellows and maroons of huckleberries and blueberries are prolific. When planning your next adventure into the Mt. Jefferson Wilderness Area, make sure to consult the Deschutes National Forest website as some areas of the wilderness require special day use and overnight camping permits. 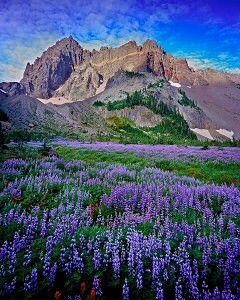 Oregon’s Three Fingered Jack rises high above Canyon Creek Meadow. A lesser known but equally beautiful mountain in the Mt. Jefferson Wilderness area is Three Fingered Jack, seen to the right. At 7,844 feet of elevation, Three Fingered Jack’s rocky spires are visible from much of Central Oregon. Easily accessed from the east, the Canyon Creek Meadow area is a favorite of hikers and horseback riders in the Central Oregon area. In prolific wildflower years, the upper Canyon Creek meadow is absolutely blanketed with lupines and various other wildflowers. 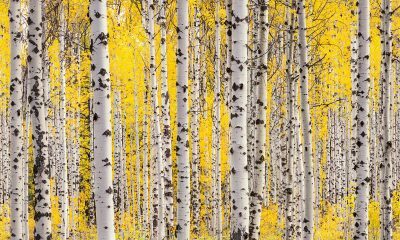 The hike to upper Canyon Creek Meadow is a very reasonable three mile hike and is doable for anyone of a reasonable fitness level. Both Mt. 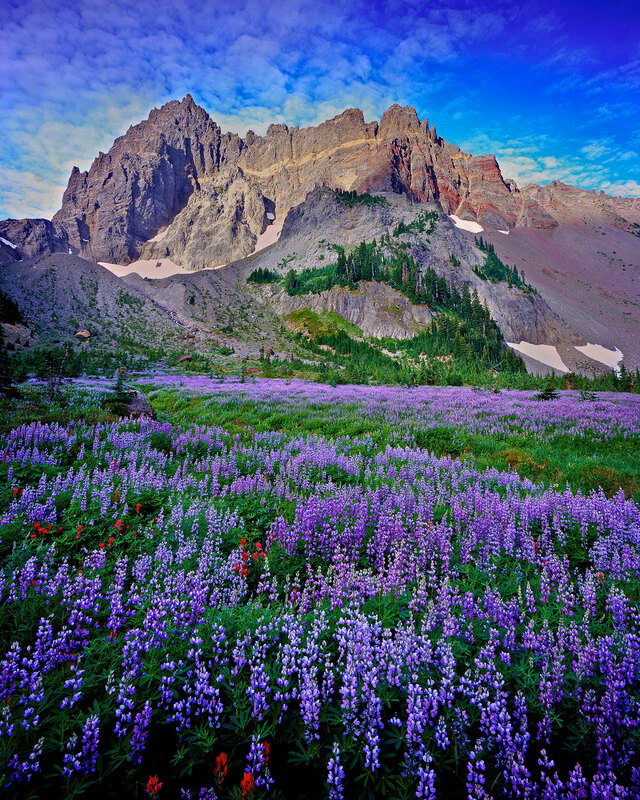 Jefferson and Three Fingered Jack, are traversed by the Pacific Crest Trail which can be tapped into via a trailhead located near Santiam Pass, located on Highway 20, west of the city of Sisters. It was an easy decision to add the Cascade Lakes Scenic Byway to the seven wonders of Central Oregon. 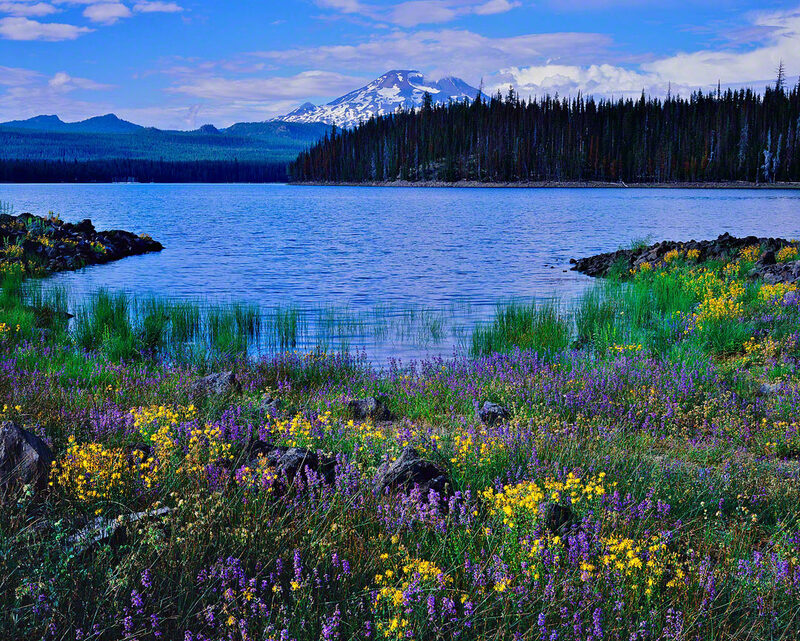 Central Oregon’s Cascade Lakes are absolutely stunning and they offer something for everyone. Mountain biking, hiking, paddling, fishing, swimming, and camping are just part of what make this area of Central Oregon special. 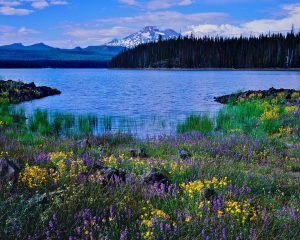 While the Central Oregon area is often referred to as the High Desert, you would never believe it when you visit the Cascade Lakes. Pine forests, lava flows, and countless lakes decorate this wonderful part of Oregon. 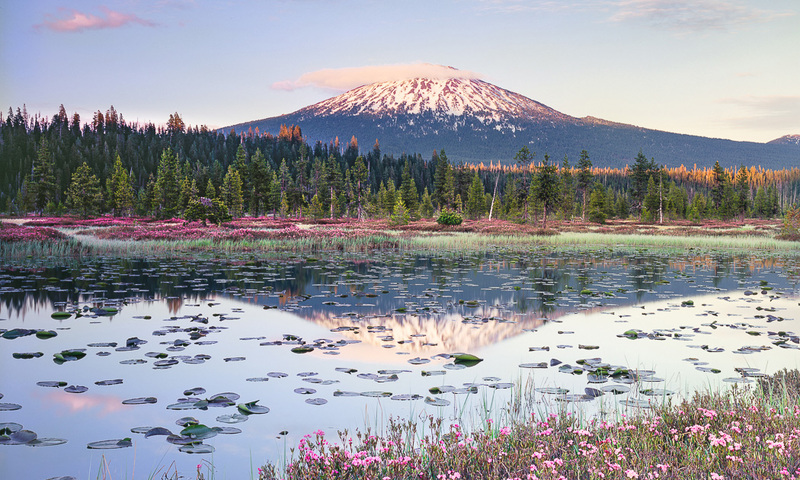 The Cascade Lakes Highway is a nationally recognized scenic byway which extends 66 miles from near Mirror Pond in downtown Bend to highway 58, near Oakridge Oregon. The First of the Cascade lakes encountered along the highway is Todd Lake, seen to the left. Todd Lake is a 45 acre gem, located a quick 1/4 mile hike off of the highway. Stocked with Brook trout, this gorgeous lake is a hikers dream. Lush meadows, backed by views of Mt. 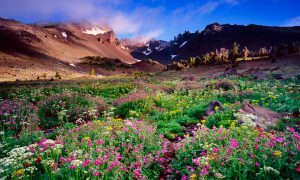 Bachelor and Broken Top Mountain are filled with wildflowers in summer. An easy, well marked trail circumnavigates the lake and is an ideal outing for kids and adults alike. The next significant lake along the highway is a locals favorite, Sparks Lake. Sparks Lake is shallow but beautiful. Camping is popular along the shores of Sparks as are hiking, mountain biking, fishing and paddling. On calm mornings, there is no more beautiful place to be. Sweeping views of Mt. Bachelor, South Sister and Broken Top can be enjoyed at Sparks. Not for from Sparks Lake is tiny, Devil’s Lake. up next, Hosmer Lake. Well known with fishermen and paddlers. The crystal clear waters of Hosmer Lake are filled with huge Brook Trout, but good luck catching them! Hosmer offers camping with few amenities but with exceptional views of Mt. Bachelor, South Sister and Broken Top. The north end of Hosmer even offers an inflowing stream with a small waterfall that intrepid paddlers can visit. Beyond Hosmer lie Lava Lake and Little Lava Lake. Little Lava lake, incidentally is the headwaters for the Deschutes River, see seven wonders of Central Oregon number 1, on its 252 mile journey to the Columbia River. Beyond Little Lava lake are several large, relatively developed lakes, including, Cultus Lake, Crane Prairie Reservoir, Wickiup Reservoir, Davis Lake, Odell Lake and Crescent Lake. Incidentally, The Junction of OR46(Cascade lakes Scenic Byway) with Highway 58 is about an hour drive to Newberry Crater, the last of my seven wonders of Central Oregon. volcanic features, lakes, streams, sweeping views, expansive forests, rocky spires and outdoor facilities that everyone can enjoy. Newberry Crater is a large shield volcano, much like Oregon’s Crater Lake. Newberry Crater’s caldera collapsed approximately 500,000 years ago, forming East Lake and Paulina Lake. Since the caldera collapse, there have been countless subsequent volcanic activities int eh Caldera. Camping facilities at Newberry Crater are excellent as are the hiking trails and options for fishing. The Oregon state record brown trout(28lbs 5oz) was caught in Paulina Lake in 2002. Some favorite activities at Newberry Crater include Mt. biking the rim trail that circles the Newberry caldera, hiking the Big Obsidian Flow trail, lounging in the lakeside hot springs, fishing/paddling, and dining at Paulina Lake Lodge. 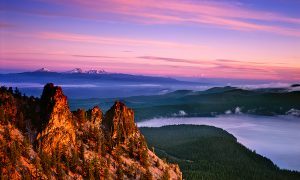 The view from the summit of Paulina Peak is one of the best in Oregon, offering sweeping views of the Central Oregon Cascades, East Lake, and Paulina Lake. An excellent narrative of our beautiful Central Oregon! Your photo’s are gorgeous. Thanks for sharing. Thanks a million for your kind words an for taking the time to leave your feedback, it is truly appreciated. I had a wonderful but difficult deciding which images to use in The Seven Wonders of Central Oregon. There were lots of landscape photos to choose from! Spot on with 7 Wonders of Central Oregon…Your photos remind me that I am not outside nearly enough these days. I keep an image on my desktop to inspire my work. Thanks so much for the kind words! I’m like you…If I’m stuck at my desk, I always like to have some Central Oregon scenery near by! All really good choices and the photos speak for themselves. I might have substituted The Painted Hills for Deschuttes River however. Thanks for the comment, Todd! The Painted Hills were on my short list of alternate wonders. While they are undeniably beautiful the primary Painted Hills area, near Mitchell, isn’t a really big area. I know there are several trails in the area but they are mostly short hikes. Not having extended activities in the vicinity in the area was a slight negative. Thanks Again for the feedback, I really appreciate it. I need to keep this list for the next time we visit Portland. I think some road trips need to be on the agenda! These are all quite beautiful Mike. Kathyl, thanks so much for the comment. There really are a lot of beautiful spots int eh Central Oregon Area! Let mw know if you need other suggestions when you visit! 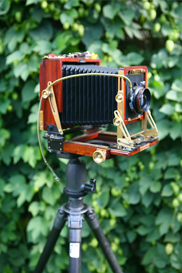 I love your 7 Wonders idea and your photography, of course, captures it like no others. I do agree that the Painted Hills would be on my list. Beautiful! Lynda, you are kind, as always! I truly appreciate your support of my work! Breathtaking photos. What a wonderful presentation of Central Oregon. Bev, you are too kind, thanks so much! Roma, you are too kind, thank you so much! Smith Rock is definitely a treasure! I never tire of exploring there! You nailed it! Central Oregon contains some of God’s most incredible creations of beauty. Lorraine, thanks so much for the kind feedback! Central Oregon is definitely a wonderfully beautiful area! Not from Central Oregon but love it all! 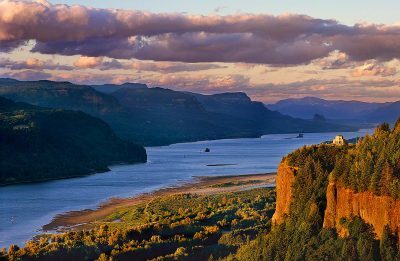 Why is Klamath Lake left out of the 7 wonders? The size & wild life would put it there for me. Marilyn, thanks so much for the kind words! While Klamath Lake is certainly a special place, I think most people consider it to be Southern Oregon rather than Central Oregon. If it were located further north, It would definitely babe in consideration! Debbie, thanks for the feedback! We are indeed lucky to have a beautiful area to call home!